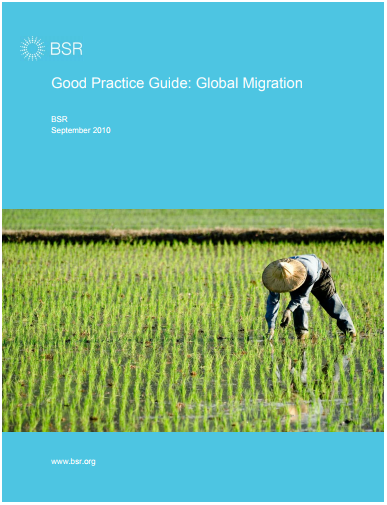 string(1063) "Resource Centre > Uncategorized > Good Practice Guide: Global Migration"
This document provides policy guidance on all key international labor migration areas for international companies, employers, and contractors. This collection of what BSR considers “good practice” is not an auditable standard and is not a substitute for company codes of conduct. This document will evolve as the dialogue on international labor migration evolves. In some areas, there are multiple options that reflect multiple informed viewpoints. This document does, however, aim to inform employer and multinational customer codes of conduct. This is applicable for all contractors (e.g., employers), and their subcontractors or contractors (each a “contractor,” collectively, “contractors”). This document incorporates international standards, current company codes of conduct, and BSR and partner knowledge of the issues. It also is aligned with the Migrant Worker Management Toolkit that provides detailed guidance on areas related to migrant workers. The two tools used in tandem guide companies on both policies and practices related to migrant workers. This document was developed in collaboration with three BSR ILM Focus Group members: Apple, Inc., Hewlett-Packard Company, and JC Penney Corporation, Inc. The focus group members provided guidance and input, but this document does not directly represent their respective codes of conduct or company standards nor does it serve as a substitute for their respective standards relating to migrant workers. The document has also undergone an extensive review with input from numerous stakeholders from international organizations, civil society, additional multinational companies, employers, employer associations, and trade unions.